I recently have been working on a spleef game where the last person alive wins. The problem is, I don't know how I would detect the last player alive. I was thinking I could do it with a scoreboard but I don't know how I would do that, and all the tutorials use /testfor which doesn't exist in 1.13. What would be the best way to do it? Tag is for differentiating in-game player and guest/spectator. deathCount scoreboard is for...well you know. For those who join the game, give them a tag(ingame) and a deathCount score of -1. When the entity who store this score(@p in this case) has a score of 1, it means there's only one player alive. Could you perhaps provide an image, or a few more words of clarification? Or, in other words, could you say where each command should go? Slightly change...dummy isn't really need. 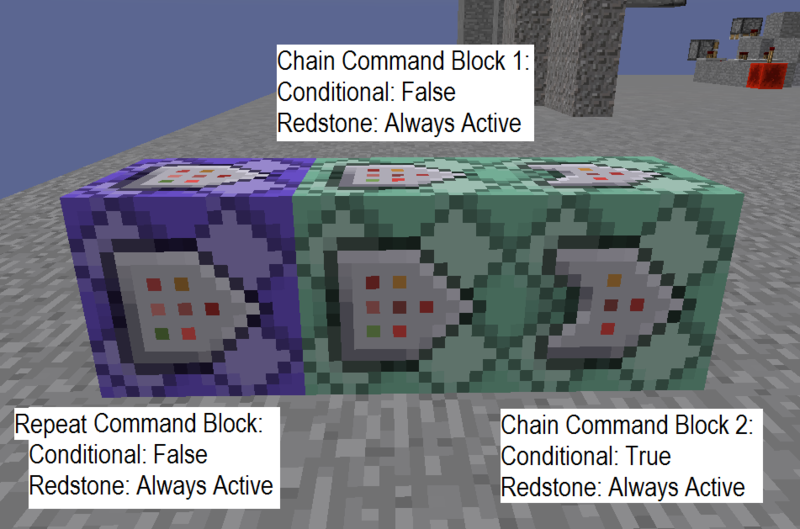 A example of how command blocks are place. I tried this on my map too, but when my brother joined the game, it didn't worked. I use 1.13.2. Is there alternative way to do that? Everything worked fine when I did it without my brother joined. It normally posted "[my nick] LAST PLAYER"
Edit: I used function that shows scoreboard while clicking TAB. When I have -1 and my brother 0, it doesn't works BUT when my brother leaves server I get message. Sorry, I cannot tell what went wrong unless you show me what you did. And AFAIK, the format doesn't change much b/t 1.13 and 1.13.2. Can you maybe make a video and show how it should looks like? Remember that it works when I'm alone at server but when they are 2+ people, it doesn't work until someone leaves.